What is a map? Why do we use them? Where are they heading? I’ll offer some insights on a modern, semi-informed, perspective on what Maps can do for people and some thoughts on where they could be going. The word Map is the shortened term from medieval latin ‘Mappa mundi’, where mappa = napkin, and mundi = world. Literally ‘napkin world’. This elegant phrasing really gets to the heart of many of our first encounters of what maps are — a simple, hand drawn description of where some place in the world is. 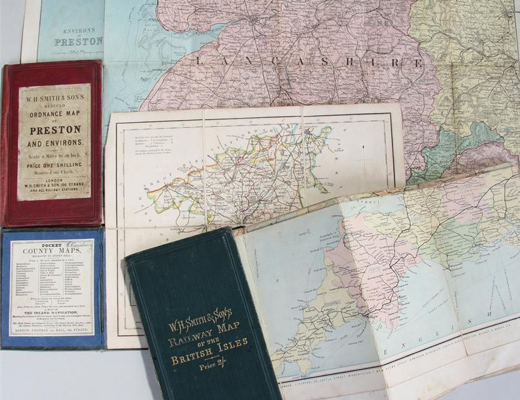 Maps have many purposes and uses, they can help people navigate somewhere they’ve never been, help find an address, visually depict land masses and their relation to one another—some maps can even help you find treasure. Sixteenth-century rulers would often display maps in their palaces to show the might and power of their cities and empires. Early maps were often used to show off; by depicting the breadth of a realm, or size of fortifications. 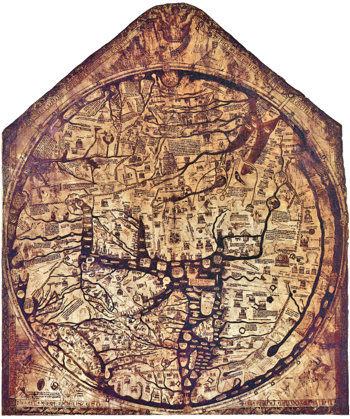 This example from the 13th century — The Hereford Mappa Mundi — is a map of the known world. At the centre of the map: Jerusalem, above it: the crucifix. As maps became increasingly cheaper to make and mass produce, more and more people were able to see where they are in relation to places in the physical world. This meant they could understand and navigate their world much easier. Before the advent of digital mapping tools, folding maps and road atlases were the means of getting around, and the London A-Z is a great example. Having digital maps meant having the world at your fingertips — albeit in the early days through a slow internet connection. 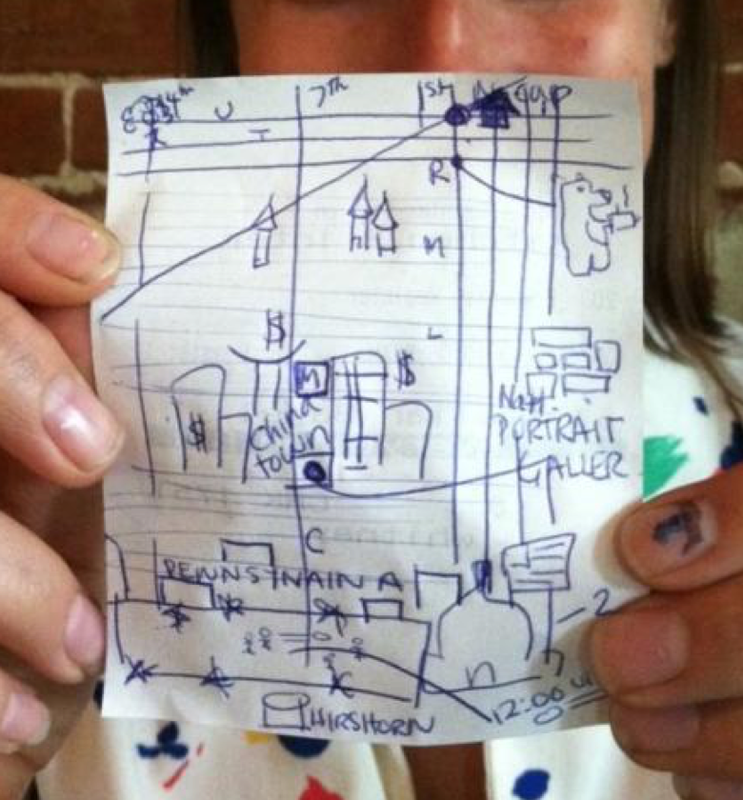 People were now able to plot routes and print a set of directions to get from A to B. 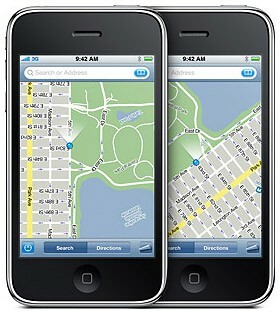 Having a mobile device with built-in GPS, wireless internet, and software that can show where you are brought us all into the modern mapping era. Now it’s hard to imagine life without geo-located maps. The map that the western world grew up with was actually designed in 1569 to aid navigation along colonial trade routes. This is known as the Mercator projection. It’s an exaggeration of the whole northern hemisphere—the depiction made North America and Europe larger than South America and Africa. Below and to the right is the Gall-Peters projection. Accurate in terms of the scale and position of Earth’s terrain, it shows the correct size and proportion of the continents. It’s being used in some schools to better represent the world to students. The ubiquitous Mercator projection on the left and the modern, more accurate Gall-Peters projection on the right. 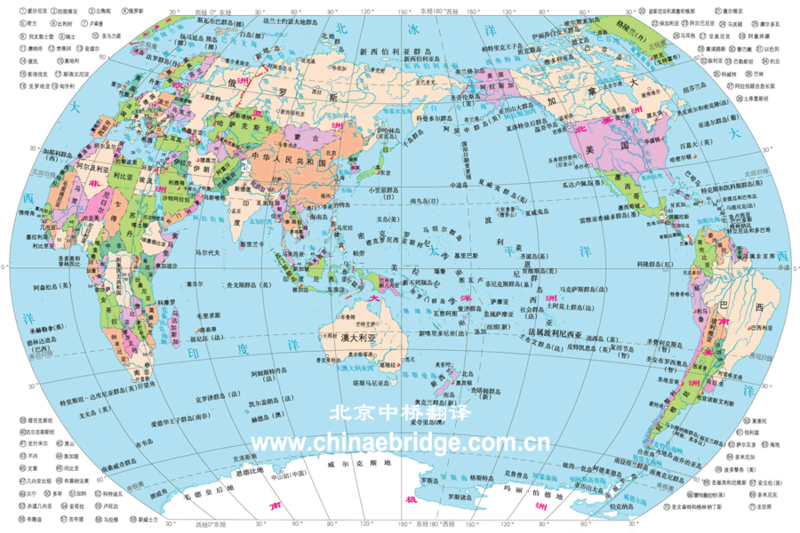 The maps in Chinese schools put China in the centre of the map, in the same way that places like the US and Europe centre on where they are — conveying a sense that their location is ‘centre of their universe’. 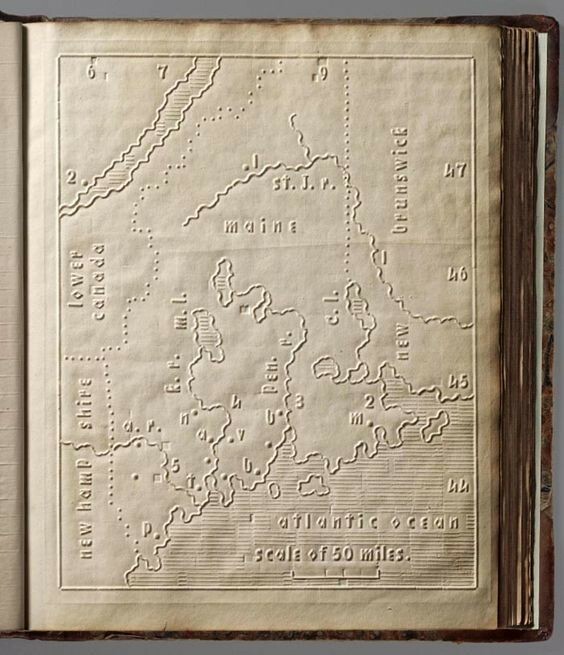 In The Atlas for the Blind—circa 1837—the text and maps are embossed on heavy paper with touchable letters, lines, and symbols representing the world’s continents, countries, and places. This small selection of traditional maps represent some basics of a place with a more generic perspective and specific intent. 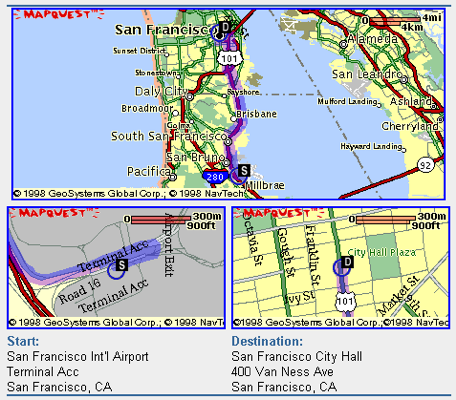 Left: Google Map — Basic perspective that includes a simplified ‘all in one’ map of layers showing streets, landmarks, geographical features and so on. Centre: Subway map — Represents things a little differently — simplifying physical space and highlighting transit lines and stations. Right: Cold war Invasion map — created by the USSR during the cold war, this map depicts import landmarks for invasion or sabotage. But wait, there’s way more than traditional cartography! The following examples push the concept of what a map can be, how it takes shape, what it represents, and how it looks and feels. 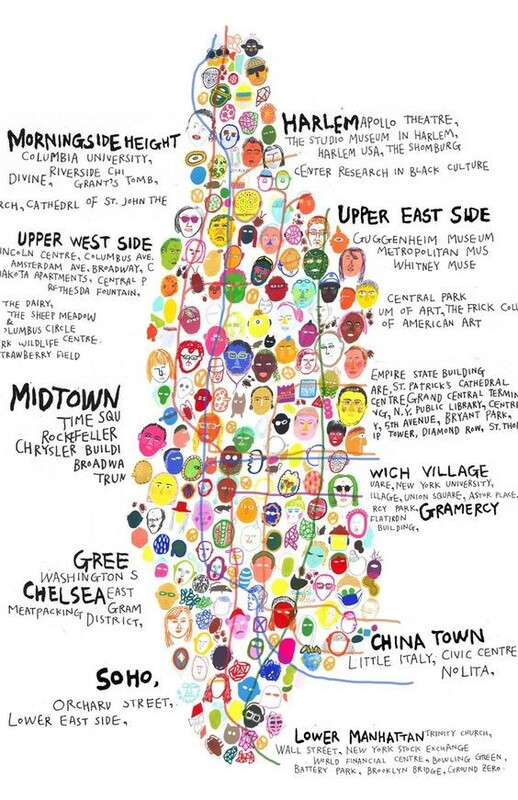 These all represent NYC, and I love looking at this broad range of representations of a place. This is also NYC — as shown as if Manhattan is folding down and extending out before you. Experiment from Mapbox showing walking distance time from your location to certain search results i.e. coffee places. Manhattan as diverse and abstract faces, neighborhoods and places, alongside descriptions of what’s there. Manhattan as circles and lines — neighborhoods and main roads — stripped back to essentials. 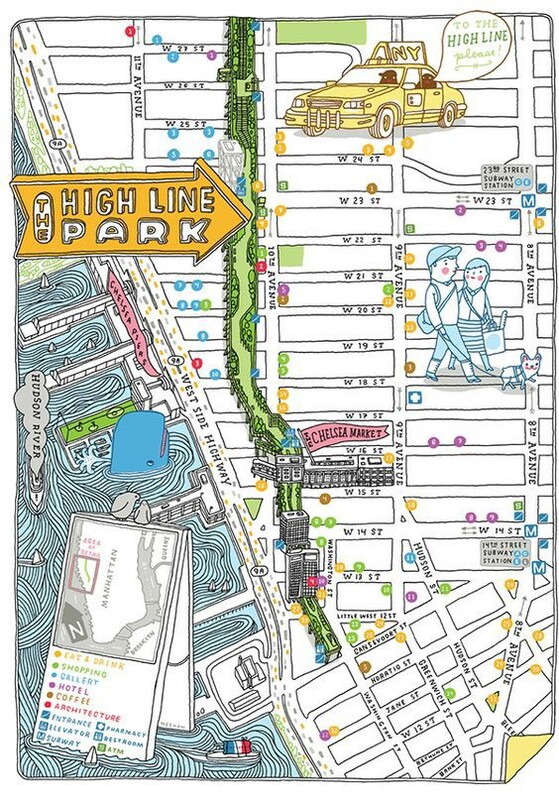 An overview of the High Line in Manhattan — with photography and minimal map. Photography highlighting points of interest along the walk. The High Line again but with illustrations, nearby food & drink recommendations, interesting architecture — and a cutaway for sense of scale. Mapping live information from all kinds of sources—such as live transit systems, health data, and social media—adds a fascinating layer of insight highlighting how people are using the world around them. 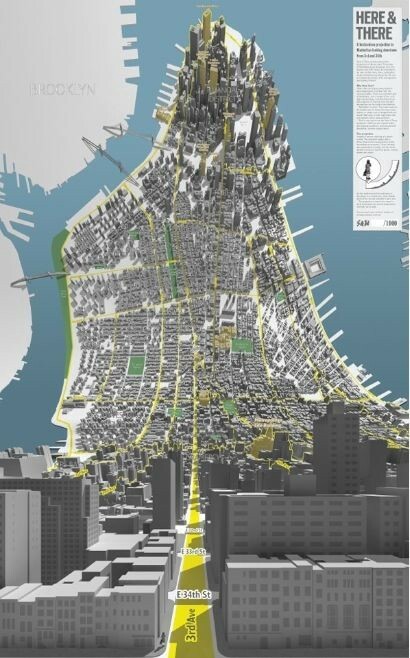 Manhattan’s transit system as mapped by Travic using open-source data. 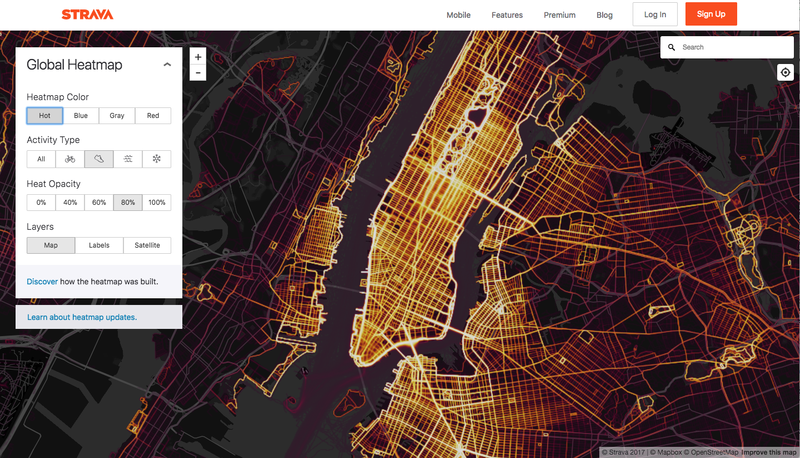 Heat map from Strava’s data set of their user’s activity as shown across NYC. 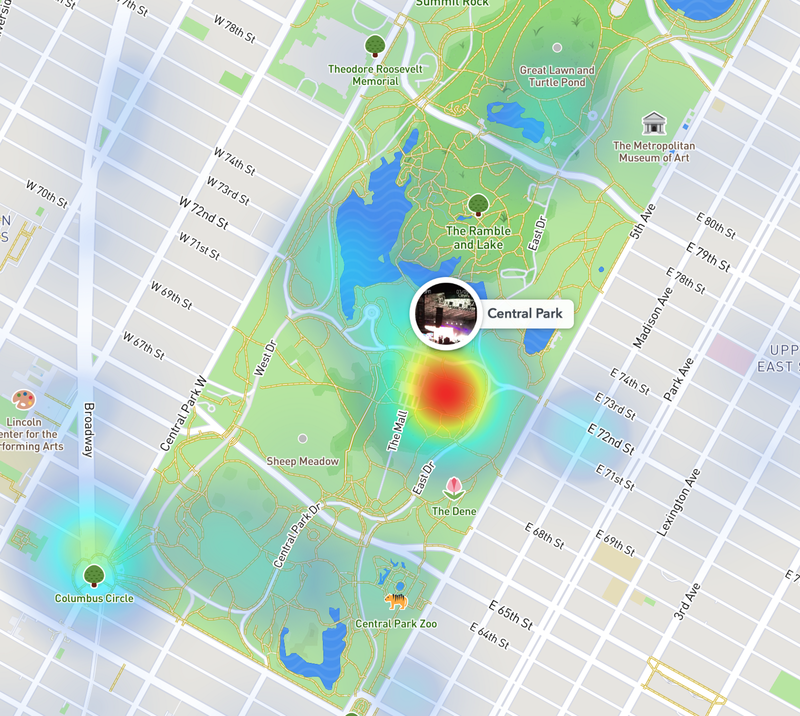 SnapChat’s heat map shows what and where people are ‘snapping’ and sharing with their friends. 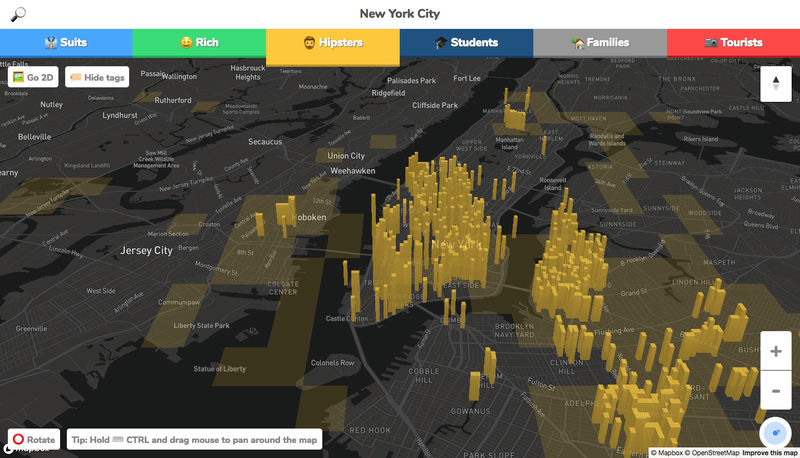 Hood Maps ask users to show where certain types of inhabitants live and the vibe of neighborhoods. With endless ways to represent our world, what’s the future? With technology and trends ever changing, the way we map our worlds are also changing. Over time, digital maps have become simpler and more streamlined — some apps use stripped-back black and white maps or minimal illustrative styling. With a whole range of products and services at our fingertips, we can pick and choose how we like to navigate and explore the places we live in and visit. When we are no longer driving — what purpose does a map have? Great read: Cartography in the age of autonomous vehicles by Justin O’Beirne. Increasingly more and more people are living in dense urban environments. 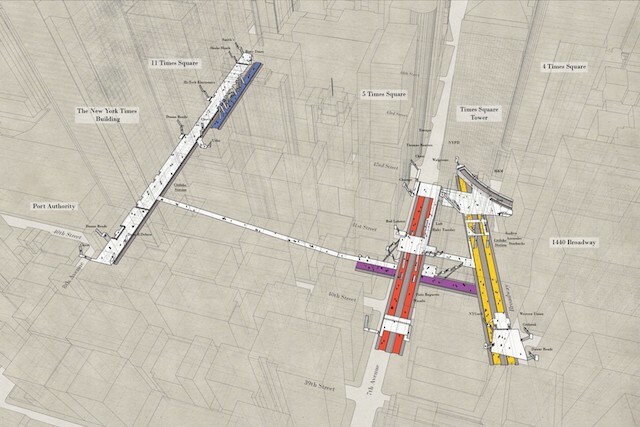 How do users navigate these dense urban cities like Tokyo and Hong Kong, with multiple layers and levels? With the advent and adoption of augmented reality in mobile devices, how do we help people in their daily lives? Google Maps announced AR Walking Navigation earlier in 2018. We’ve seen cartography and the concept of mapping change dramatically over the past several years. People are now walking around with an incredibly advanced mobile device with which they can locate themselves in reference to a whole range of sophisticated digital maps. With the adoption of on-demand lifestyles—services that collect and drop you off somewhere, bring products and food to your doorsteps, and even massage you—modern life is evolving rapidly. Society is changing and the value of knowing exactly where you are in relation to a visualisation of a physical place (i.e. a map) is also changing. When was the last time you analysed a road map like you did before GPS / navigation maps? How often do you follow turn-by-turn directions, or request on-demand cars like Lyft to come take you somewhere? 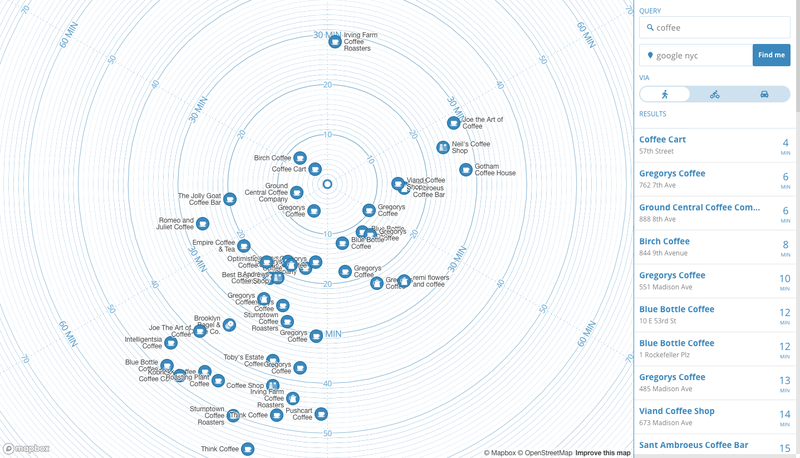 How frequently do you look at and use a map? The future of maps is incredibly exciting with endless possibilities. We’ll unlock how best to represent three dimensions in an elegant and sophisticated way, moving past the limitations of mapping a globe onto two dimensions. So, the next time you design for ‘place’ and want to map and represent physical space, open your mind wide and think about how to design for a map.